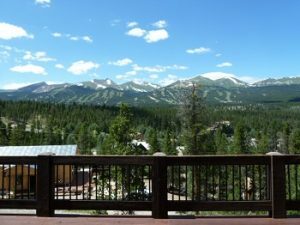 In Breckenridge Real Estate spectacular ski area views can be found in Huron Heights. Huron Heights is located on the north end of Breckenridge before Main Street. There are 61 lots in Huron Heights ranging in size from 0.50 – 1.40 acres. As of 2013 there are 47 existing Breckenridge homes leaving 14 vacant parcels of land left to be developed. The existing homes in Huron Heights were built between 1963 – 2010. Huron Heights is located approximately one mile from Breckenridge’s Main Street. While this Breckenridge subdivision is close to town it is not officially in the Town of Breckenridge, so there is no transfer tax. These Breckenridge homes are on well and septic not town water and sewer. Huron Heights homes can be found on Forest Hills Drive, Huron Road, County Road 451 and County Road 452. The majority of the lots and homes in Huron Heights have amazing views of the Breckenridge Ski Area which is what draws most buyers to this area. If you are looking for a home or lot in Summit County Real Estate with views and close to town, Huron Heights is worth a look.